NEW ORLEANS — Oregon’s reign during the indoor season did not end with the 2017 NCAA Division I Indoor Track & Field Championship, which was the program’s 7th title in eight years. 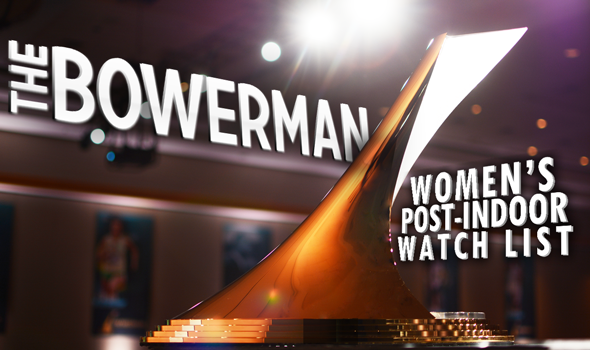 Because of the individuals who put together such impressive performances, the Ducks will get to celebrate a few days longer, as the program once again placed five of their women’s athletes on The Pre-Outdoor Season Bowerman Watch List. Hannah Cunliffe JR Oregon Sprints Federal Way, Wash.
Sha’Keela Saunders SR Kentucky Jumps Suffolk, Va.
Sasha Wallace SR Oregon Hurdles Castro Valley, Calif.
Hannah Cunliffe, Raevyn Rogers, Sasha Wallace, Ariana Washington and Deajah Stevens grace this month’s roster of talented track and field athletes, and they all do so for good reason. The first four won event titles, while Stevens came up big in the 60 meters and 4×400 relay, helping the Ducks break the indoor championship scoring record set by Texas in 1988 with a total of 84 points. Cunliffe captured her 1st NCAA Division I Indoor event title, as she blew past the competition with a finish of 7.14 in the 60 meters. The Federal Way, Washington, native wasn’t done, though. She competed in the 200 meters and placed 2nd, becoming the 9th-best performer in the event in collegiate history with a time of 22.53. Interestingly enough, Cunliffe was runner-up in the 200 meters to her own teammate. Washington absolutely dominated the race, finishing in 22.42 for the 2nd-fastest time all-time in collegiate indoor track. The duo became the first pair of teammates to finish 1-2 in the 200 meters at NCAAs since Auburn did so in 2010. Washington also found her way to the podium in the 60 meters, as she finished 3rd with a time of 7.20. Wallace tied for the 5th-fastest time in collegiate indoor history in her title-winning 60 hurdles race. The senior from Castro Valley, California, posted a time of 7.87 in the preliminaries before running a 7.90 in the finals to outdistance her opponent by .03 seconds. Rogers added her name to the collegiate record book on a few occasions after this past weekend. The junior ran the 5th-fastest time in the 800 meters in indoor collegiate history with a mark of 2:01.09, successfully defending her title in the event. Additionally, the product from Houston, Texas, anchored the 4×400 relay that ran what ended up being the 2nd-fastest mark in indoor collegiate history at 3:27.07. After only receiving votes during the last Bowerman Award Watch List release, Stevens came out and showed why she belonged. The native of Westchester, New York, was also a part of that relay, running the fastest split out of anyone in College Station, Texas, with a time of 51.11. Stevens also placed 5th in the 60 meters with a time of 7.22, netting the Ducks four points. This, of course, is not the first time five athletes from the same school have made their way on The Bowerman Award Watch List. This same quintet was on the February edition of The Bowerman Award Watch List this year, marking the first time in the history of The Bowerman Award that one program had more than three athletes on the Watch List at one time. Joining the Ducks are five athletes from the Southeastern Conference. Keturah Orji (Georgia), Raven Saunders (Ole Miss), Sha’Keela Saunders (Kentucky), Karissa Schweizer (Missouri) and Kendell Williams (Georgia) all saw their names on the watch list after turning out superb performances in College Station last weekend. Four of the five women from the SEC etched their names into the collegiate indoor record books. Raven Saunders broke her own women’s indoor collegiate record in the shot put with a winning throw of 19.56m (64-2¼) after setting the record a little more than a year ago. Shortly before recording the throw that would win her the title, the product from Charleston, South Carolina, notched what ended up as the 4th-furthest throw in indoor history at 19.20m (63-0). Williams was hoping to break her indoor collegiate record in the pentathlon, but came up a bit short. However, her mark of 4682 is still incredibly high on the all-time list, as the native of Marietta, Georgia, performance ranks 3rd in indoor collegiate history. With that outing, the senior now owns seven of the top eight indoor collegiate pentathlon marks, all-time. Schweizer last received votes for The Bowerman Watch List in early February, but she came back strong with a stellar outing at the Gilliam Indoor Track Stadium. The junior ran the 6th-fastest 5000 meter race in indoor collegiate history for the title, wrapping up in a time of 15:19.14. With that outing, Schweizer became just the 4th woman in Missouri history to capture a national championship. The native of Urbandale, Iowa, wasn’t done on the weekend, as she placed 2nd in the 3000 meters the next day with a time of 9:09.33. You can hardly fault Orji for not entering the indoor collegiate record book like her SEC peers. She had four of the top six triple jump performances in collegiate history just a few weeks ago at the SEC Indoor Championships, including setting the American record at 14.32m (46-11¾) . What Orji did do, however, was find herself on the podium twice this past weekend. Orji, who hails from Mount Olive, New Jersey, won her 2nd indoor triple jump title with a leap of 14.11m (46-3½) – over a foot more than her nearest competitor – while also finishing 3d in the long jump with a leap of 6.58m (21-7¼). Falling off the Watch List – but still receiving votes – was Texas A&M’s Jazmine Fray. Joining her in the receiving votes category was Miami (Fla.)’s Shakima Wembley, Southern California’s Kendall Ellis and Arkansas’ Taliyah Brooks.